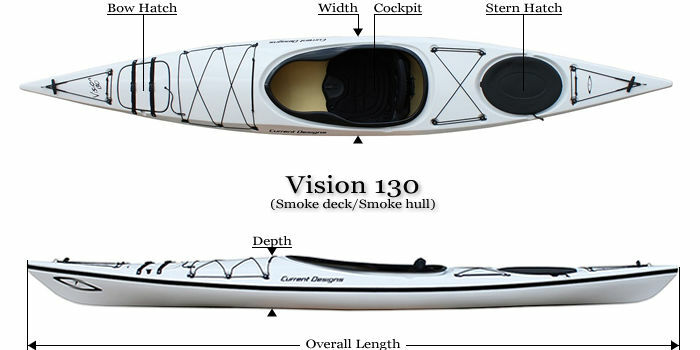 If you're looking for a small sized transitional kayak, the composite Vision 130 is the boat for you. A bit more nimble than the 14' and 15' models, it has a unique handling and confidence inspiring feel. Like all of the Visions, this kayak features the safety of two bulkheads. Try one out to fully appreciate the weight and fit of the Vision 130. All members of the Vision family have a generously sized keyhole cockpit that allows for easy entry and exit, as well as ample foot room and large storage capacity. They also feature lower faceted decks that have minimal wind exposure making for an enjoyable in-control paddling experience. These features coupled with the confidence inspiring 24” beam allow the Vision 130 paddler to experience a true kayak fit and feel while developing a myriad of skills at their own pace. The Vision 130 is constructed from a vacuum bagged composite hybrid material, which allows for an unsurpassed combination of light weight, stiffness, toughness and value. Composite Hybrid - 40 lbs. Keyhole Cockpit: A keyhole cockpit blends the openness of a recreational cockpit and the integrated thigh braces of a touring cockpit. The result is an easy to enter and exit cockpit that offers performance, fit, and solid connectivity to the kayak.